Today has been Christmas Jumper Day when people put on a Christmas jumper and donate money to Save The Children. My neighbour has raised thousands of pounds for them over many years by opening her garden and having events at her house. 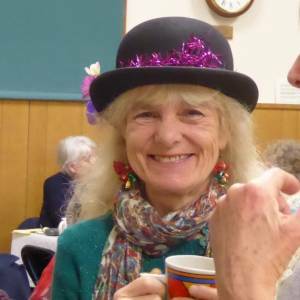 Today she held a Christmas Jumper Day coffee day which was very well attended by people from the village. There were lovely cakes and biscuits to eat plus items for sale and a raffle with money going to the charity. It was a most enjoyable morning, I got to chat to lots of people that I know as well as some that I didn't. My near neighbours were there with Hugo, the little dog that I look after when they go out for the evening. 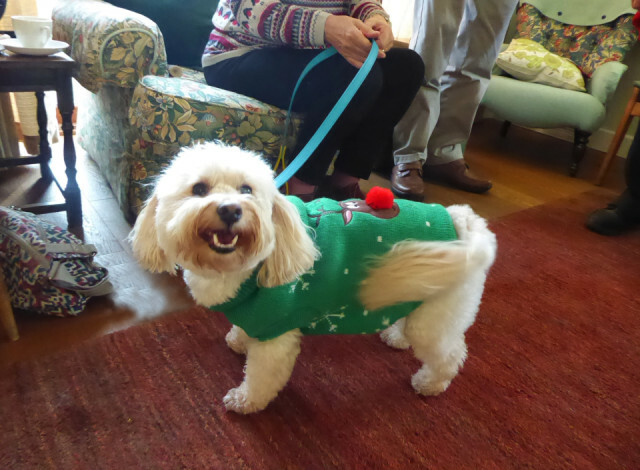 He was looking very dashing as he modelled a jumper from the latest canine winter collection. He was very willing for me to do a fashion shoot there and then - his rates are very reasonable.